Myopia: Is it really a threat? Myopia also known as nearsightedness, occurs when the lens in the eye grows too long from front to back. When this happens instead of focusing images on the retina—the light-sensitive tissue in the back of the eye—the lens of the eye focuses the image in front of the retina. 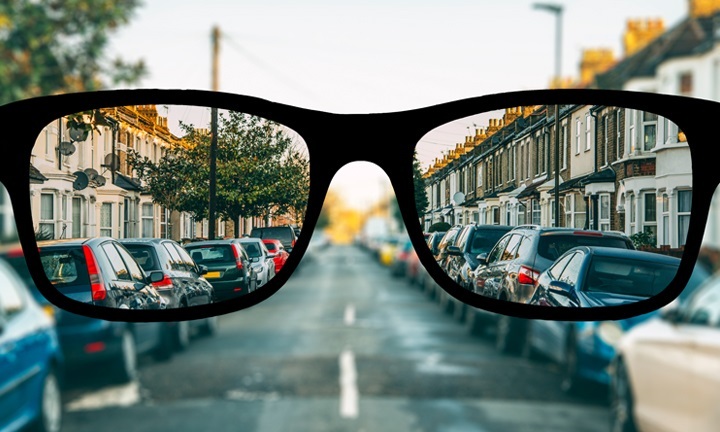 People with myopia have good near vision but poor distance vision. It is the most common cause for impaired vision among individuals below the age of 40 years. Roman physician Galen was the first to describe the term myopia. Way back in the 17th century Johannes Kepler described the optics of myopia and its correction using concave lenses. So for generations, eye care practitioners have managed myopia using concave lenses. Evidence based literature reveals that the number of myopes are increasing at an alarming rate globally. The National Eye Institute reports that currently 1.45 billion myopic people in the world, a figure that is growing rapidly. 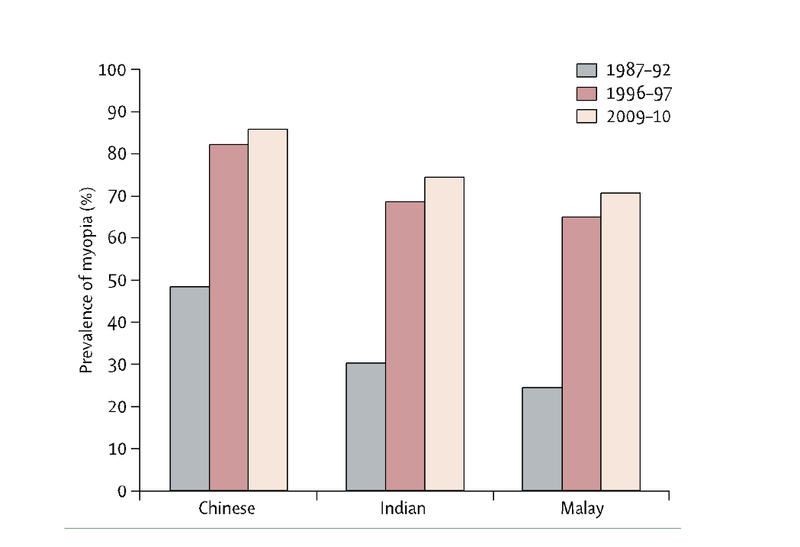 The below graph is from a peer reviewed journal, which clearly indicates growth is prevalence over the last three decades. Simple extrapolation of the is data shows that if this continues, 50% of the Global population will be myopic by 2050. India is also following trend like other Asian countries. The prevalence in older studies for refractive error correction was 2-4% in school going children, and today in different studies across India this number has gone up to anywhere between 4-15% based on urban/ rural/ private/ government schools especially in children over the age of 11 years. What is the Risk factors involved in myopia? The myopic eye is longer than the non-myopia and clinical studies reveal that Myopes are known to have thinner corneas as well as thinner retina which is more stretched in myopic eyes. This increases their risk to develop retinal detachments, glaucoma etc. This risk increases proportionately with increase in myopia, especially in pathological myopia. Myopia is a multifactorial condition, however the documented high risk factors include genetic, eye diseases, excessive near work, food lack of vitamins like high glycemic index foods etc. A patient’s myopia is considered progressive if the onset of Myopia is less than 10 years of age or the progression of myopia is > 1.00D per year or 0.50D every 6 months. Several techniques have evolved for Myopia prevention and control. Life style management is one of them It helps prevent or slow down the myopia progression. Other myopia control modalities include prescription of progressive spectacles lenses designed for myopia management, orthokeratology and use of low dose atropine drops ( 0.01%). Excessive work that strains the eyes for longer duration is most documented reason for myopia among children whose parents are not myopic. This is cited due to early and excessive schooling, lack of outdoor activity and early exposure to handheld and digital devices like handheld games and mobile phones. The strongest evidence for this is, that almost all myopic children have Vitamin D deficiency and most of our non-myopic children have Vitamin D insufficiency today. Not to use handheld games and mobile phones. Increase outdoor games, preferably in early morning sunlight. In schools, not to stay indoors during recess breaks, but to go outdoor and play. Reduce intake of junk food, as they are high glycemic index foods and fuel growth of eyeball. Routine full eye examinations, as under-corrected myopia is one of the reasons for myopia progression. Monitoring of Vitamin D3 levels. These simple rules can help every myopic child to prevent further damage to their eyes. Keep away from handheld games, digital devices and mobiles phones. Eye examination every 6 months for children below the age of 16 years.